Hypertension can lead to hypertrophic heart disease is a multi-factorial, multi-scale problem in which altered whole body hemodynamics and neurohormonal factors lead to a complex growth and remodeling response in the heart. The cells and extracellular matrix in the myocardium initially compensate to the abnormal environmental factors with altered gene expression, changes in contractile and mechanoenergetic function, cell and tissue structural remodeling, in turn further affecting circulatory dynamics and often leading to decompensation and failure. 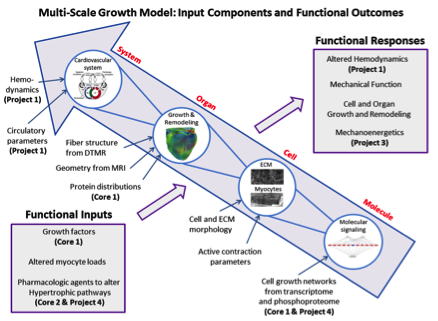 The goal of this project is to integrate novel cell signaling models of myocyte hypertrophy into organ-level continuum models of ventricular growth, remodeling and mechanoenergetics coupled to hemodynamic models of systemic hypertension, and validate these multi-scale models with experiments in rats subjected to ventricular hemodynamic overload and treated with drugs that target key response pathways. The resulting model systems will enable integrative molecular mechanisms of hypertrophic heart disease to be investigated quantitatively and systematically.